The Henry Glass Very Merry Holiday Party! We are off to Houston and are looking forward to seeing many of you at our booth! We've got a great line-up for Schoolhouse and some of our fabulous designers are doing book signings at our booth! 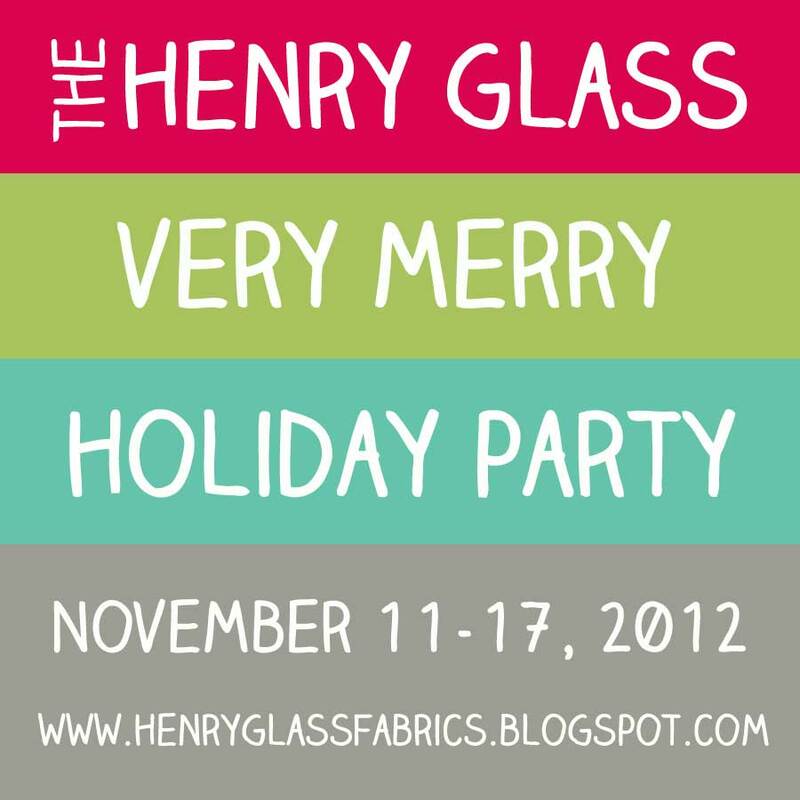 We are excited to announce The Henry Glass Very Merry Holiday Party! 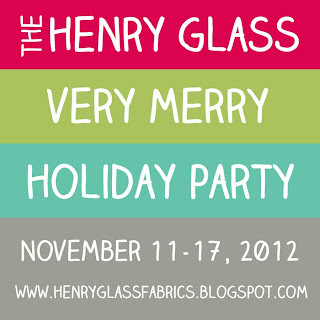 It will be so much fun as with all of our holiday blog parties! 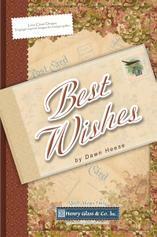 Will you come to our book signings at Quilt Market? 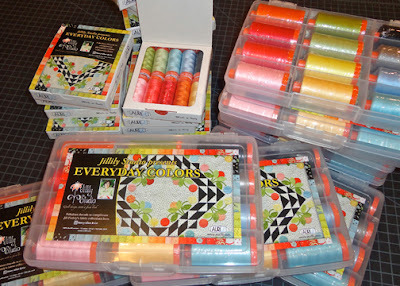 Remember to enter our giveaway for Jill Finley's e-book and fabric bundle! Details here. Welcome to week 4 ! Dawn Heese's Sentiments Sampler Quilt is looking so fabulous! Each block is prettier than the previous ones! 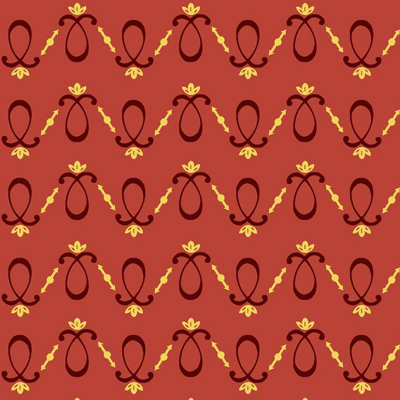 You can download today's pattern here. Are you making the quilt as we go along? To get the same beautiful looking quilt, make sure that you go out and buy Dawn's fabric line, Best Wishes, at your local quilt shop. Many of us are getting ready for Quilt Market! The excitement is building! We are looking forward to showing off our new designs! Remember to enter our giveaway for some lovely Beyond The Gate by Jill Finley. You could win an e-book too! Details here. Jill is also have a GRAND PRIZE GIVEAWAY! Enter here. Good luck! 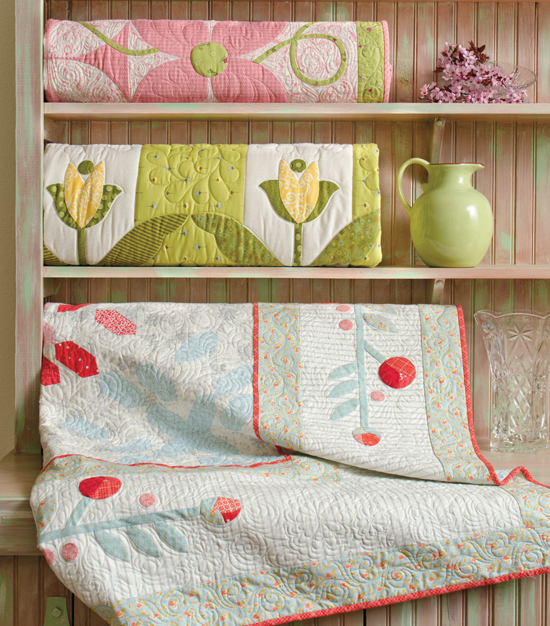 Welcome to the home sweet quilt Blook Tour! Our very own talented Jill Finley of Jillily Studio has penned a fabulous new book for Martingale & Co.
We love Jill's fresh style. Her quilts are so very pretty but so gorgeous enough to use in decorating your home. Have you seen Jill's new home and studio? You'll have to check out the photos from her recent open house. You should start here if you haven't seen the photos! We are considering packing our bags and flying out to stay with Jill! Martingale & Co. has some great photos too! Here are a few of our favorites from the book. The first three quilts would be great to showcase in a little girl's room. The applique is simple yet sophisticated. Dare we say it? Yes, we are starting to think about making holiday decor. These pillows are easy and simple. 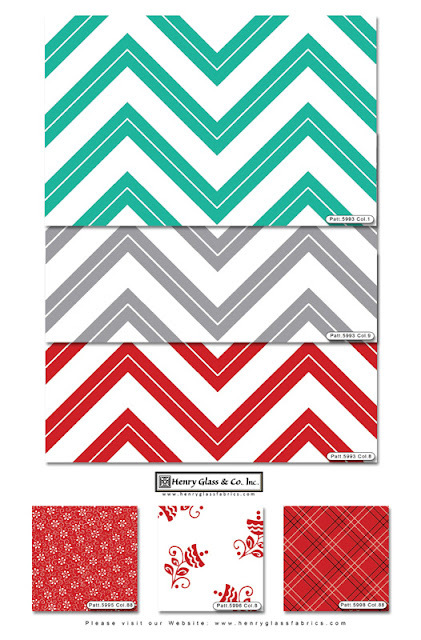 You can use holiday colors but still use the pillows long after if you choose the appropriate prints. Are you looking for easy gift-giving ideas? These are so darling and quick to whip up as hostess gifts. We think that the book has a great variety of designs for every quilter. The directions are clear and easy to follow. It almost feels like Jill is sitting right there beside you and guiding you along the way. Jill is hosting a grand prize giveaway. 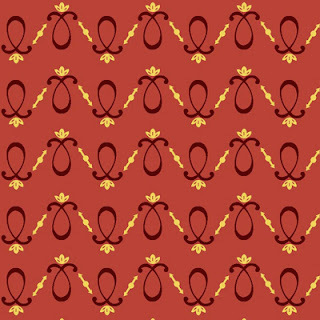 It includes her current fabric line, Beyond The Gate, is oh so pretty! The line should be showing up in stores! Run out and buy some of this beautiful line! She used Beyond The Gate in the pillow and the quilt hanging from the railing. They turned out so wonderfully! Her giveaway will also include some Aurifil thread! Gorgeous colors in the box that compliment Jill's fabrics. There are other goodies worth $150! Wow! Make sure that you like our blog! That's part of the entry requirements! We are going to have our own giveaway! 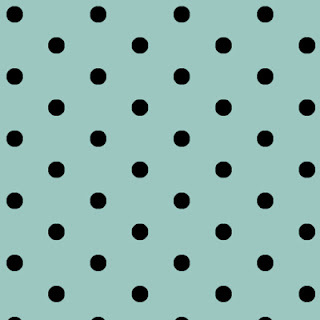 Like our blog and tell us your favorite color to use in quilting. That is, what is your go-to color? 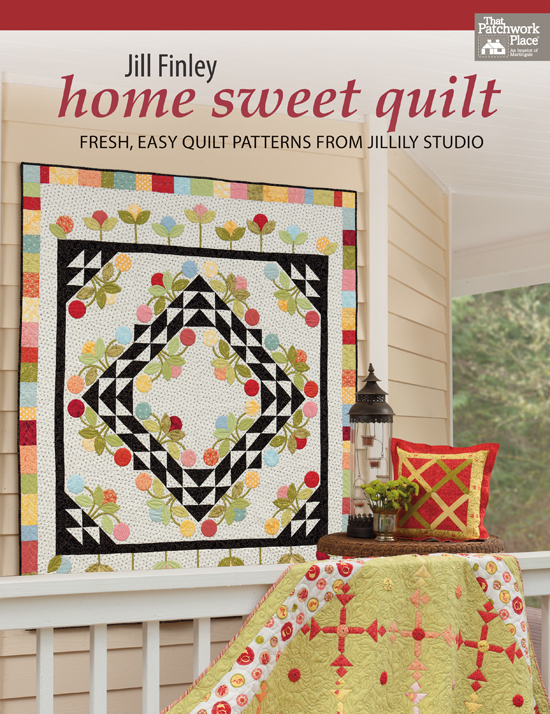 One lucky winner will win an e-book copy of home sweet quilt and a fat quarter bundle of Jill's fabric! Contest ends Monday, October 29 at midnight! Make sure that you come back soon! 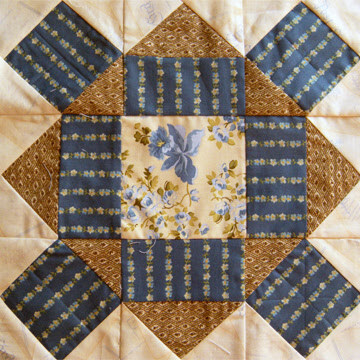 We are off to Houston for Quilt Market and will be back with photos. Remember to check out the other blogs for their own giveaways! WHEN ? WHO ? WHERE ? Janet Nesbitt and Pam Soliday, the talented ladies behind Buggy Barn are going to be signing books at our booth in Houston! We are so excited. Don't you love the cover? Please join us at our booth for these signings and for previewing our latest collections. In addition to the book signings, we look forward to seeing you at the Henry Glass Schoolhouse Presentaions. See the schedule below. Barbara Jones of QuiltSoup will be one of several of our Henry Glass designers participating in the Henry Glass Designer Showcase III. It's going to be so much fun! 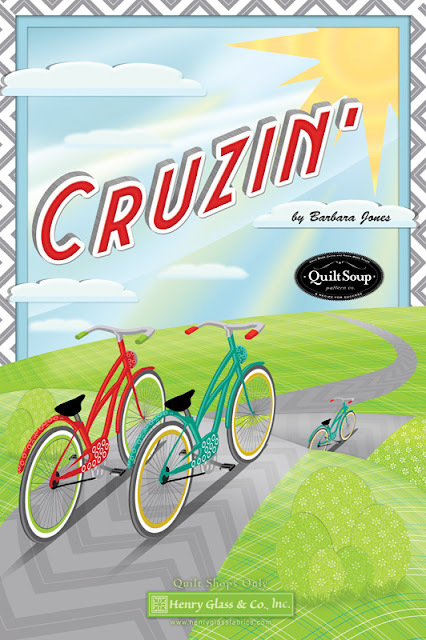 Barb's Cruzin' line will be available soon. Stay tuned for an interview with Barb! It's going to be fun! We love the bicycles! Which one of these prints do you like? 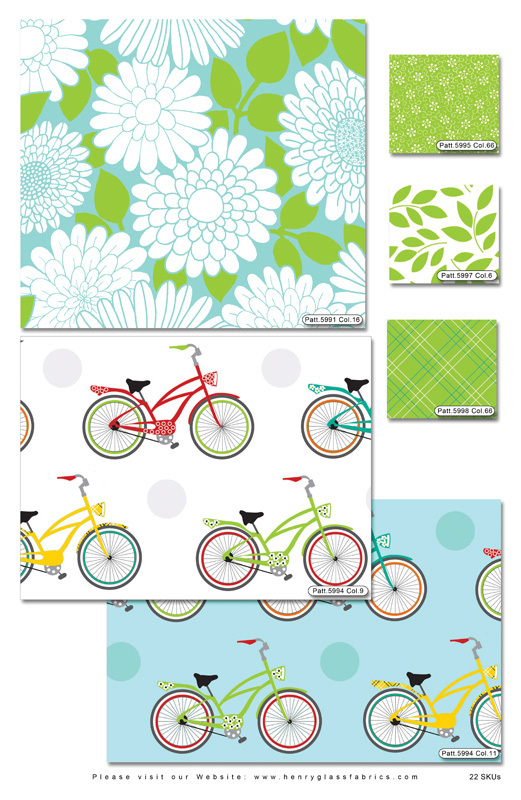 Look for these fabrics in your local quilt shop in November! 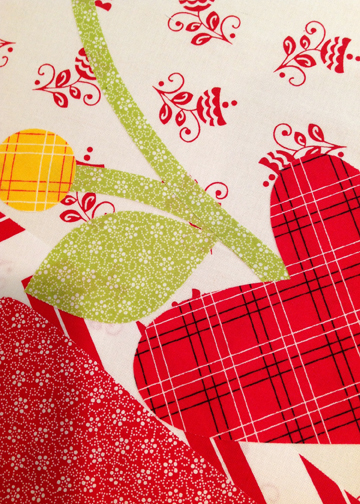 With all of the Quilt Market preparations, how does a designer keep motivated? We asked Barb about her other hobbies. Beautiful! Thanks for sharing, Barb! 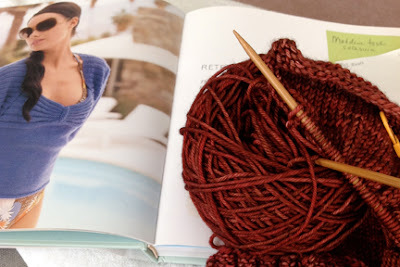 What other hobbies do you have? 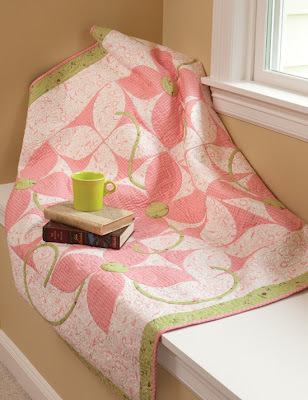 Remember, Jill Finley's home sweet quilt Blook Tour is still going on! Details here. Make sure that you follow along. You can win some goodies! 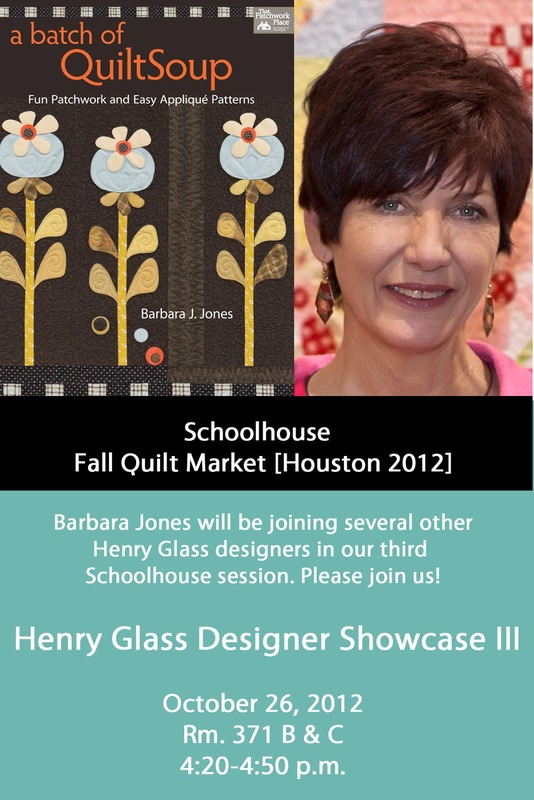 QuiltSoup designer, Barbara Jones will be in Houston! We spoke to her recently and we begged her for a sneak peek! The photo at the top is all that we could wrangle out of her. For those of you going to Houston, you will have to visit Barb and for the rest, make sure that your local quilt shop owner visits Barb in Houston! We are excited to announce that Barb is another fabulous Martingale & Co. designer who will be doing a book signing at our booth! Make sure that you come by for your copy. First come, first served for limited quantities! Speaking of wrangling, Barb participated in a cattle drive last year. We thought that it was awesome and she shared a couple of photos with us. Joe Daniels (left) and Charlie is on the right. Joe and his wife Euarda own the land and the ranch. She quilts and they are Barb's friends. This is where they started the drive as they brought the cows off of the mountain. This is a photo of the bar-D-bar Ranch where the cows live. What an awesome experience! Come back tomorrow for more news from Barbara! p.s. We do have a winner for the Vicki Oehlke, Bouquet Splendor. We apologize for the delay in announcement. The winner is Betsy Lewis from Florida! We contacted Betsy and the goods are on their way! 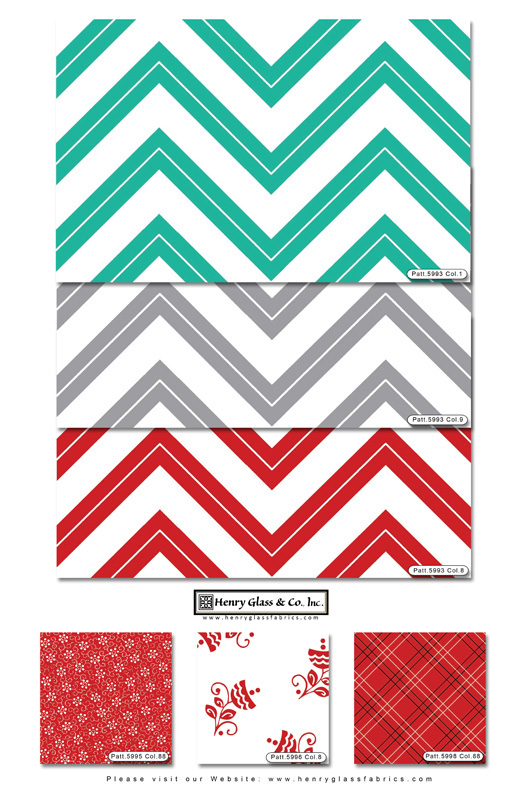 Another Awesome Quilt Market Announcement! Can you contain your excitement? First we announced, Linda Lum DeBono's book signing, then Kim Diehl's plus her Schoolhouse! Now we are excited to let you know that Jill Finley will be signing books at our booth and at Martingale & Co.'s too! There's so much fun that's going to happen at Booth 424. Don't miss out! We are only giving away books on a first come first served basis. You can stop by and say hello or take photos too! 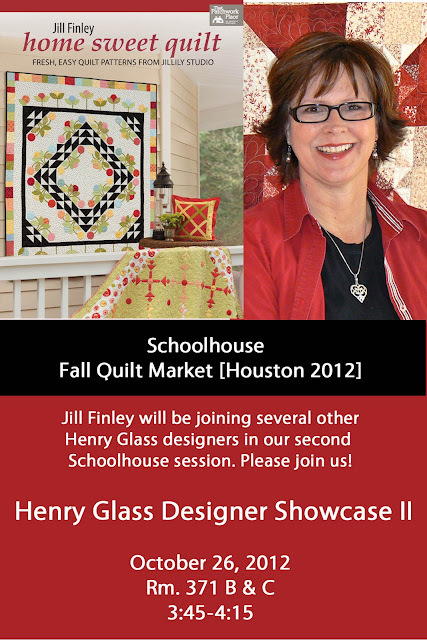 Jill will be part of our exciting line-up at Schoolhouse too! 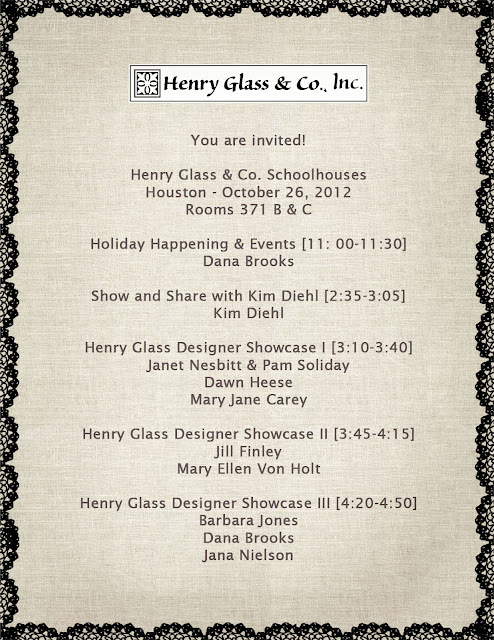 She will be in the second session of the Henry Glass Designer Showcases. 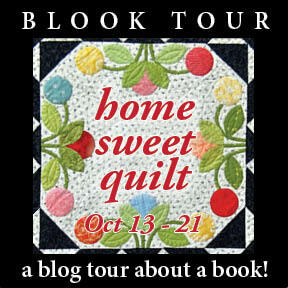 Remember that Jill's home sweet quilt Blook Tour is still going on. You can still win here, here and here. 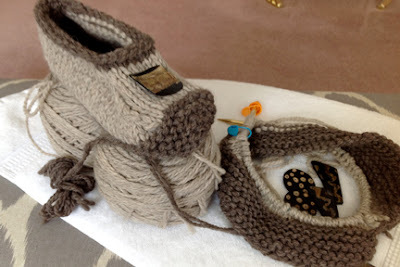 Have you been following along? Designer Dawn Heese has designed block number three and it looks so pretty! You can download the directions here. 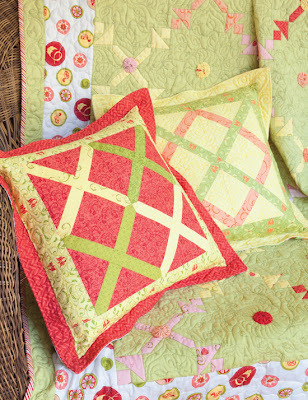 Make sure that you go out to your local quilt shops to look for Dawn's line, Best Wishes! Do you have some already? Which is your favorite print? 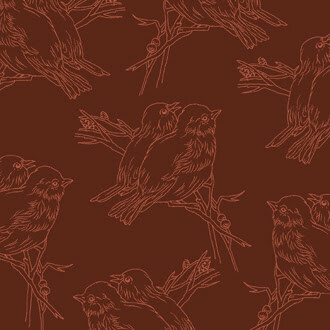 We are loving the birds today! It comes in red and blue. We can't choose our favorite colorway. 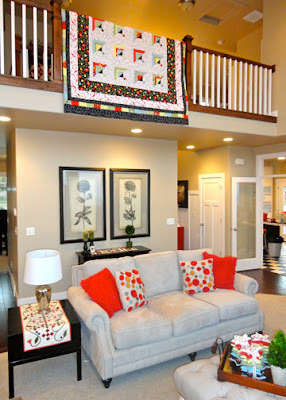 Today, designer Jill Finley's home sweet quilt Blook Tour continues. Check out the participants here. Linda Lum DeBono's boys reviewed the book yesterday. We're on later this week. Please go and give the tour some love! The book is fabulous! home sweet quilt Blook Tour! 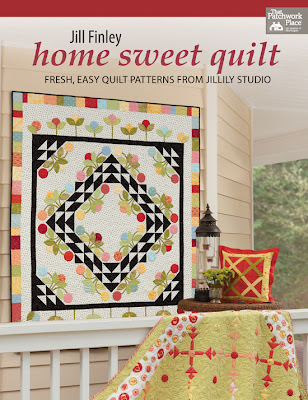 Day 1 of Jill Finley's home sweet quilt Blook Tour is here! Hop on over to Aurifil Thread's blog for a great preview. Here are the other participants too! 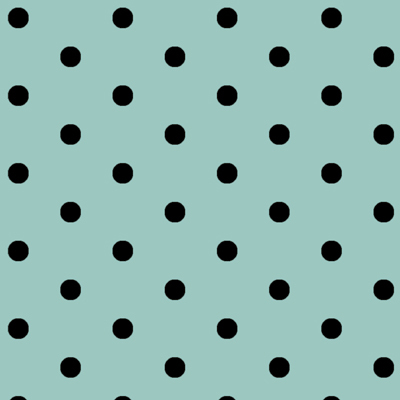 We are continuing our exciting Quilt Market announcements! Next up is Jill Finley of Jillily Studios. 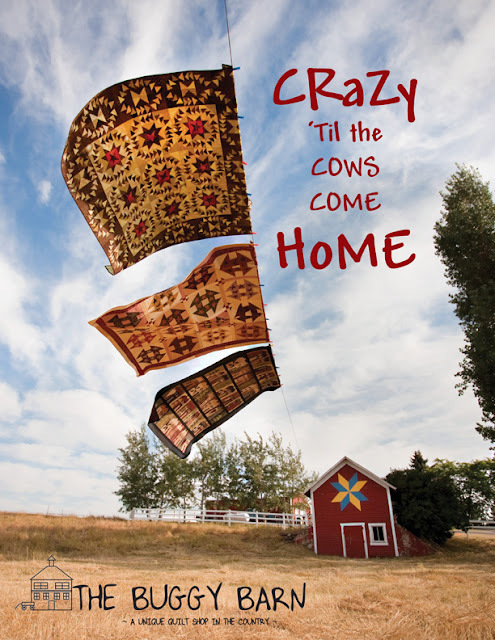 Come by our booth and to Martingale's booth for her book signing for her new book, Home Sweet Quilt. It's so fresh and so pretty! You can preview her book starting tomorrow when her blook tour launches! Details here. 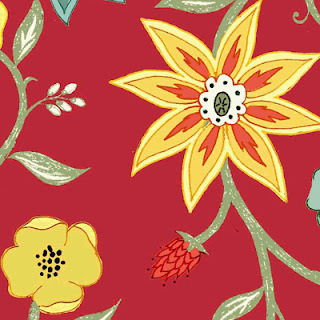 Linda Lum DeBono and Henry Glass Fabrics will be hopping along on this tour! Join us! You can win some copies of her books. 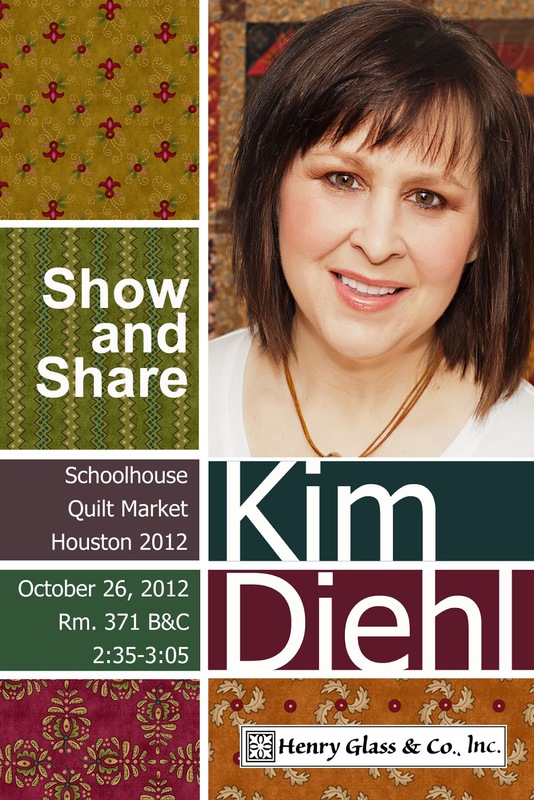 We've got more great news today about Kim Diehl at Quilt Market! Please join us at our Schoolhouse Presentations! Kim will present, "Show and Share with Kim Diehl" in Room 371 B & C from 2:35 to 3:05! 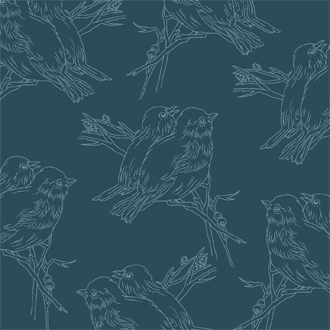 We are excited to announce that Kim Diehl will be at Quilt Market this fall in Houston! Come by and visit us for a book signing with Kim at our booth and then one at the Martingale & Co. booth. Did you notice that we said "Part I" up there on the post title? 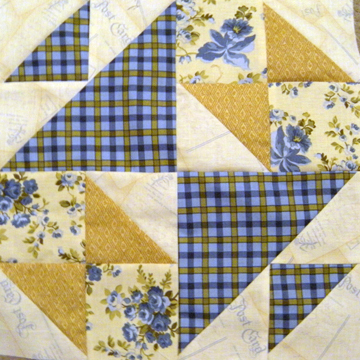 Well, come back for Part II as we continue to roll out our Quilt Market events! 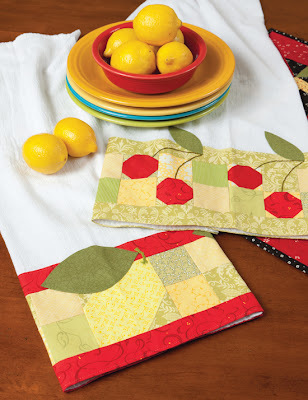 Who's going to Quilt Market? We have some exciting events planned for our booth! Linda Lum DeBono will be at our booth and at the Martingale & Co. booth for a couple of book signings. Make sure that you get to the booth early. We have a limited supply of books to give away! Stay tuned for some more exciting announcements. Follow us here or on Facebook to keep up to date. Let's Vogue With Lizzie B Cre8ive! 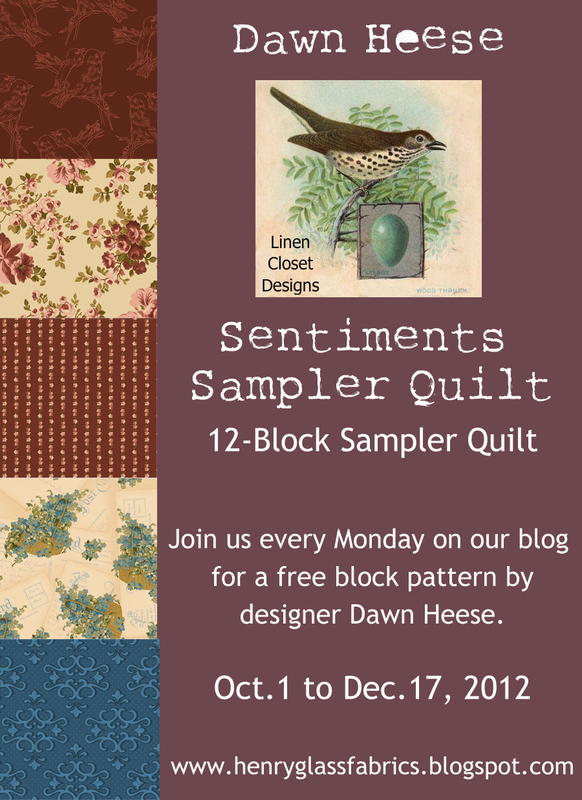 Sentiments Sampler Quilt: Block One!